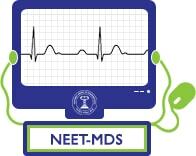 The NEET MSD 2019 Exam will be of 240 marks. General Anatomy including embryology and histology with 14 marks weightage. General human physiology and Biochemistry - 14 marks. Dental Anatomy, Embryology & Oral Histology - 14 marks. General Pathology and Microbiology- 14 marks. General and Dental Pharmacology and Therapeutics- 14 marks. Oral Pathology and Oral Microbiology - 15 marks. Oral Medicine and Radiology - 15 marks. Prosthodontics and Preventive Dentistry - 14 marks. Orthodontics & Dentofacial Orthopaedics - 14 marks. Prosthodontics and Crown & Bridge- 14 marks. Conservative Dentistry and Endodontics- 14 marks. Oral and Maxillofacial Surgery- 14 marks. Public Health Dentistry- 14 marks.